You see, when King Koopa invades the Mushroom Kingdom (we do not know the historical context for this annexation, so it would be unfair to condemn him based simply on this action) he uses his magic powers to turn the people into blocks. "Wait!" You said. "That's stupid! You can't just make something like that up, use real facts and..."
...Yeah. It's canon. 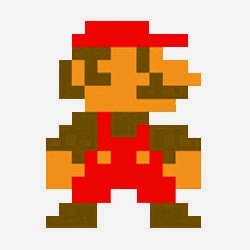 The people of the Mushroom Kingdom are the blocks that Mario runs over. Mario's quest sees him smashing every block he sees, awarding himself points for every transformed person he turns to dust like a twisted madman. Sometimes when Mario hits a block he frees a mushroom... which he instantly consumes in a mad lust. The indiscriminate killing of Koopa's troopers is one thing, but his disregard for civilian casualties is nothing short of a war crime. Super Mario Bros 2 gives us a glimpse into Mario's mind, as the entire adventure is a dream. We see that even in his sleeping moments he is obsessed with killing and destruction. Of course, later evidence has come to light showing that Mario spent much of his free time playing party games and going karting with Koopa, casting serious questions as to how allied the two really were in the total destruction of the Mushroom Kingdom. Uh... again, Mario might not be AWARE that the Toads are turned into blocks. Also, it saids blicks not block as in the Toads were glued together to form block and Mario hits his hand on the blick-made blocks to free the Toads.